Amazon.com description: Product Description: "The book addresses a sorely missing set of considerations in the real world... This is a very timely book." XML is a tremendous enabler for platform agnostic data and metadata exchanges. However, there are no clear processes and techniques specifically focused on the engineering of XML structures to support reuse and integration simplicity, which are of particular importance in the age of application integration and Web services. 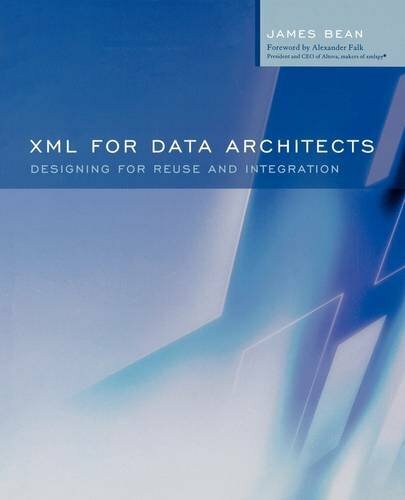 This book describes the challenges of using XML in a manner that promotes simplification of integration, and a high degree of schema reuse. It also describes the syntactical capabilities of XML and XML Schemas, and the similarities (and in some cases limitations) of XML DTDs. This book presents combinations of architectural and design approaches to using XML as well as numerous syntactical and working examples. * Designed to be read three different ways: skim the margin notes for quick information, or use tables in the appendix to locate sections relevant the to a particular issue, or read cover-to-cover for the in-depth treatment. * Contains numerous tables that describe datatypes supported by the most common DBMSs and map to XML Schema supported data types. * Unique focus on the value added role and processes of the data architect as they apply to enterprise use of XML. About: "The book addresses a sorely missing set of considerations in the real world.